Home > Nutrition > Can You Eat Fast Food on a Diet? Fast food isn’t usually synonymous with dieting, but it’s possible to make good and healthy choices with fast food when you are in a rush for something to eat, and not do too much damage to your good weight loss intentions. The key to eating wisely and fitting fast food into a weight loss diet is to know exactly what you are eating. Don’t rely on descriptions such as ‘lite’ or assume that any menu option that includes fish or chicken is automatically going to be healthy. Do some research and you can pick lower fat alternatives from the high street fast food outlets. Most of the fast food retailers on the high street are now making a big issue of publishing their nutritional information, if not in the stores then it will be online. If you know you are going to be eating out, you could do some research on the Internet before you go. In general, basic is best when it comes to fast food on a diet. So even though the filet o fish might sound better for you, ditch it for a basic hamburger and you’ll save calories. A KFC salad sounds enticing but if you add the extras and smother it in mayo or dressing then you may as well just go for a chicken burger with all the trimmings because the fact and calorie count in some of the salad dressings can be quite spectacular. So, if you don’t want to trouble the standard fast food restaurants, and prefer to spend your cash in more healthy-sounding eateries, you might be tempted to go for a handmade sandwich, organic granola bar or brownie. While these options are undoubtedly delicious and will be better for the environment and most likely made from fresh ingredients – the calorie and fat count can still be quite astounding. The trouble with places such as these is that they won’t always have nutritional information on the packaging, unlike your standard supermarket sandwich. They are usually made fresh on the premises, and although by law they have to give ingredients, the calorie and fat count is likely to vary. Your best bet is to go for the simple, dressing free sandwiches if dieting is an issue – a chicken salad sandwich may be boring but at least it will be an organic chicken sandwich!! 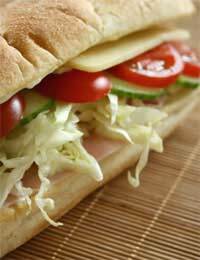 Combining fast food with healthy, you could always try the Subway or sandwich bar options. With both you will get to choose exactly what goes into your sandwich, what bread you use, the size of the sandwich, and if there’s any butter. You can add as much salad as you like to bulk the meal out, and in a sandwich bar you’ll usually find a bowl of fruit from which you can add to your lunch. Sandwich bars are usually good for pick your own options, you can also choose a salad, a soup or jacket potato which can be a good alternative if you’re bored with sandwiches. They also have endless variations which can be healthy or fatty, depending on your mood!